As you would know if you’ve been to see a Disney animated feature in cinemas recently you always get a charming little short before the actual movie starts. They’re often insubstantial, but they’re always feel good experiences. 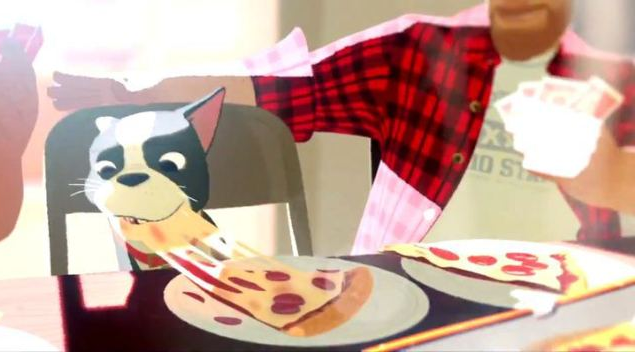 ‘Big Hero 6’ is no different, presenting you with a short simply titled ‘Feast’. Of the Disney shorts I’ve seen, including most recently the 11 times I saw ‘Paperman’ the 11 times I saw ‘Wreck-it Ralph’ in cinemas (at least 6 of which were regrettable purely because of all the money I spent on the movie, on cinema food and on my wonderful Vanellope plush that I won after numerous tries at the cinema’s claw machine) and ‘Get A Horse’ from before ‘Frozen’, Feast would have to be my absolute favourite. 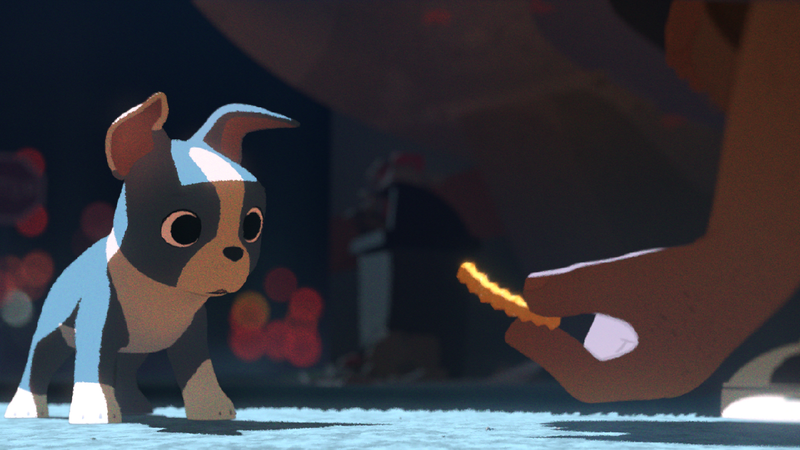 Feast is about a little dog named Winston, and as anyone who has owned a dog would know they can be real greedy guts. I know that being at least the second most guilty person in my family for feeding my dog bits and pieces of whatever I’m eating, if not the most. Whenever Mum is making dinner you can always expect her to be sitting around the kitchen hoping she’ll be fed, and whenever someone is eating you can always expect her to be there, especially when it’s me. You look at their sad little faces as they beg and you can’t help but feel they deserve something a little more special than their boring old dog food, so you feed them. They beg for more and you give them more, and then some more, but when it gets to a certain point you just don’t feel right about the potential for them to take that kind of treatment for granted. After that you continue to see them beg with sad little faces until you finish your meal, trying not to give them any more, sometimes unsuccessfully. It may seem selfish on the part of the dog, but deep down you know how much they appreciate it. Having the experience of living with a little dog of my own, I find ‘Feast’ to be charming not only at face value but as a little real life story that I can relate to. Winston is a street dog who gets taken in by a man living on his own. First he gets the pleasure of eating a small chip, then the pleasure of eating dog food, then the pleasure of eating bacon and eggs and so on until little Winston starts to find it normal to be fed large full meals. When it’s taken away from him by his owner’s new-found romantic interest in a woman who’s into healthy eating, Winston starts to get upset. Shortly after Winston’s owner breaks up with his girlfriend, and Winston gets to go back to eating whatever junk food he can get his tiny paws on, all the while, unbeknownst to Winston, his owner is slowly deteriorating both mentally and physically over the breakup. Winston eventually realises the state of his owner and finally finds that little place in his heart that appreciates what he’s gotten from him, helping to patch up his owner’s romantic relationship in the process and accepting the worth of his bowl of dog food. Of course, though, dogs will be dogs, and once his owner gets married and has a baby the dog is more than glad to eat up all the big messes the baby makes playing with his food. As the old saying goes the dog *is* man’s best friend, but food is most certainly always a dog’s second best friend. Feast is also very pretty and atmospheric as Disney is. It’s animated using the Meander system, as Disney call it, which was developed for Paperman, and the Hyperion rendering system developed for Big Hero 6. The focus of the camera is always on the dog with all human characters having a blurred focus even when their face is in full view, which puts you in its metaphorical shoes of the dog. The line-free minimalist style gives the short film a very cozy and sometimes homey feeling to its background art, and it makes the food that the dog eats look every bit as tantalising as the dog sees it. As Paperman did, Feast uses very minimal sound aside from the background score. It lets its storytelling speak almost entirely through its visual display and is very light on dialogue, which not only keeps you firmly in the dog’s point of view but also tells the story in a pretty and effective way. Even in a minor display such as this, it respects the audience’s intelligence to allow them to pick up on what’s going on through visual storytelling rather than exposition, and I’m very much a fan of that. Feast is a wonderful short film that tells a simple but grounded and resonant story in a wonderful way. If you’re going to see Big Hero 6 in cinemas, I strongly recommend getting there a few minutes before the movie starts, or getting your hands on the eventual DVD and Blu-Ray release of Big Hero 6 and scouring through the extras for it, to see the wonderful short film that is Feast. If you’ve ever owned a greedy but deep down loving dog like Winston you may love Feast as much as you love Big Hero 6, or even more.